Contexts are single events or actions that leave discrete, detectable traces in the archaeological sequence or stratigraphy. They can be deposits (such as the back-fill of a ditch), structures (such as walls), or "zero thickness surfaciques", better known as "cuts". Cuts represent actions that remove other solid contexts such as fills, deposits, and walls. An example would be a ditch "cut" through earlier deposits. Stratigraphic relationships are the relationships created between contexts in time, representing the chronological order in which they were created. One example would be a ditch and the back-fill of said ditch. The temporal relationship of "the fill" context to the ditch "cut" context is such that "the fill" occurred later in the sequence; you have to dig a ditch before you can back-fill it. A relationship that is later in the sequence is sometimes referred to as "higher" in the sequence, and a relationship that is earlier, "lower", though this does not refer necessarily to the physical location of the context. It is more useful to think of "higher" as it relates to the context's position in a Harris matrix, a two-dimensional representation of a site's formation in space and time. The principle that layers can be no older than the age of the most recent artefact discovered within them. This is the basis for the relative dating of layers using artefact typologies. It is analogous to the geological principle of faunal succession, although Harris argued that it was not strictly applicable to archaeology. Archaeologists investigating a site may wish to date the activity rather than artifacts on site by dating the individual contexts which represents events. 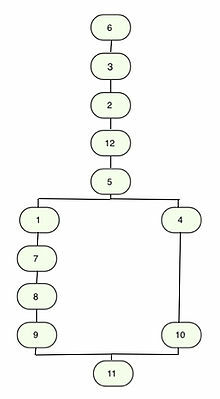 Some degree of dating objects by their position in the sequence can be made with known datable elements of the archaeological record or other assumed datable contexts deduced by a regressive form of relative dating which in turn can fix events represented by contexts to some range in time. For example, the date of formation of a context which is totally sealed between two datable layers will fall between the dates of the two layers sealing it. However the date of contexts often fall in a range of possibilities so using them to date others is not a straightforward process. Take the hypothetical section fig A. Here we can see 12 contexts, each numbered with a unique context number and whose sequence is represented in the Harris matrix in fig B.
Trample in the base of cut 5 formed by workmen's boots constructing the structure wall 2 and floor 6 is associated with. If we know the date of context 1 and context 9 we can deduce that context 7, the backfilling of pit 8, occurred sometime after the date for 9 but before the date for 1, and if we recover an assemblage of artifacts from context 7 that occur nowhere else in the sequence, we have isolated them with a reasonable degree of certainty to a discrete range of time. In this instance we can now use the date we have for finds in context 7 to date other sites and sequences. In practice a huge amount of cross referencing with other recorded sequences is required to produce dating series from stratigraphic relationships such as the work in seriation. One issue in using stratigraphic relationships is that the date of artifacts in a context does not represent the date of the context, but just the earliest date the context could be. If one looks at the sequence in fig A, one may find that the cut for the construction of wall 2, context 5, has cut through layers 9 and 10, and in doing so has introduced the possibility that artifacts from layers 9 and 10 may be redeposited higher up the sequence in the context representing the backfill of the construction cut, context 3. These artifacts are referred to as "residual" or "residual finds". It is crucial that dating a context is based on the latest dating evidence drawn from the context. We can also see that if the fill of cut 5 – the wall 2, backfill 3 and trample 12 — are not removed entirely during excavation because of "undercutting", non-residual artifacts from these later "higher" contexts 2, 3 and 12 could contaminate the excavation of earlier contexts such as 9 and 10 and give false dating information. These artifacts may be termed intrusive finds. ^ Harris 1979, p. 29. ^ Harris 1979, pp. 30–33.